At some of our meetings we’ve had some discussions about how to best fertilize the veggie patch and this is something that often features on gardening programs on TV. It astounds me somewhat that “across the board” recommendations are often made about adding all sorts of things for various reasons without understanding that different soils need different responses. Probably most home veggie gardeners grow their produce to get better nutrition and flavour. So, we’ll start with a comparison of minerals in organically grown produce compared with that in the supermarket. The following figures have been taken from a pamphlet produced by the Organic Retailers and Growers Association of Australia (OGRAA) around 12 years ago for mineral content of veggies from the supermarket compared with organically grown. Organically grown veggies usually had in excess of 10 times the mineral content of supermarket equivalents and this may explain why people often have salt on supermarket tomatoes but not home grown ones. If you have a look at calcium levels in organic versus supermarket it might offer part of the reason as to why osteoporosis is a problem in developed countries and not a problem in less developed ones. Perhaps before suggesting some ideas on trying for the optimum we might have a look at where the production of supermarket veggies could be going wrong for nutrition and flavor. Let’s first try to understand some of the complexities of nature. Plants have a symbiotic relationship with soil bacteria and fungi and some of the sugars and proteins made by the plants are extruded by the roots to feed them. In return the bacteria and fungi make otherwise insoluble minerals available to the plants and protect them from harmful micro-organisms. By controlling the compounds the plants give off through their roots they can control their mineral uptake. Cost pressures on commercial agriculture often require optimum outputs and this can mean synthetic fertilizers making more minerals available in a water soluble form rather than through microbial action. Usually commercial agriculture makes the three major elements Nitrogen (N) Phosphorus (P) and Potassium (K) (NPK fertilizers) readily available in a water soluble form. Increasing nitrogen levels can increase growth up to a certain point, but did you know that there is an inverse relationship between available nitrogen and vitamin C content, particularly in green leafy plants? That is, the more nitrogen, the less the vitamin C. The water soluble fertilizers and nitrogen inhibit the soil microlife and thus upset the plants mineral balance. So, the first thing we should be looking at is avoiding/minimizing synthetic fertilizers. The pH of soils is often discussed and the chart below seems to be the most common guide, it indicates that different minerals are more available at different levels of acidity and alkalinity. So, we have acid soil and wish to change it to more towards neutral, what are our options and what should we do? I’ve heard recommendations of adding lime, dolomite and wood ash, all of which will move acid soil towards neutral, what do I recommend? Lime is a compound of predominately Calcium Carbonate, dolomite a product containing both Calcium and Magnesium and neither are very water soluble. Wood ash has a number of different minerals, many of which are quite soluble and it can be a beneficial addition in moderation. What of lime and dolomite? A ratio of about 4-5 parts of calcium to one part magnesium is considered desirable in the soil so if the ratio of calcium to magnesium is greater than 4:1 then perhaps dolomite would be best. If the ratio is less than 4 parts of calcium to 1 part magnesium then perhaps lime should be favoured. So, we’ve decided to grow super cabbages we need to whack on a bit of lime. I’ve heard that there was a saying that lime made the father rich and the son poor, how could that be? Abundances of different elements can either inhibit or stimulate the plants uptake of other elements and calcium is an element that can affect the uptake of a number of other minerals. Calcium can inhibit the uptake of potassium, iron, magnesium, boron, zinc, phosphorus and manganese. So, I’ve tried to give you a bit of the theory behind something too complex for me to get my head around and if you can’t get your head around it either I’m sorry. A friend once came up to me worried about her broad beans, what’s the problem I asked? “I’ve got a pH meter and the soil my broad beans are growing in is 5.5 and my book says they like soil from 6.5 to 7.5.” “How do the plants look?” I asked. “They look good she replied.” “Have they got many pods of beans?” “Lots, what should I do” she replied. I thought about it for a bit and suggested that she throw away the pH meter or the book or both. Earlier I said how plants have a symbiotic relationship with soil bacteria and fungi, I think of empowering the soil microlife as the first step. So, what can we add with confidence to help acid soil? In heavy soils acidity can be largely overcome by aeration, that is break up the compaction and a thus add the element oxygen, with this there are only plus’s, the main one is increased microbial action and this makes all the elements the plant needs much more available. Increasing the humus levels in the soil enhances the microlife also and increases the moisture retention. Aeration of heavy soils will increase root growth and as the roots die of f it increases the amount of carbon in the soil and humus is formed from it. 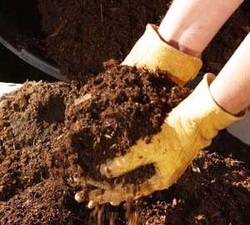 Dig compost, ideally made with some basalt dust worked through it into sandy soils. Having done that our cabbages still aren’t big enough (well they are but our neighbors are just that little bit bigger) so what do we do. We can get a soil test done and follow their recommendations or perhaps what I call Feral Soil Analysis. Legumes fix nitrogen in symbiosis with specific soil bacteria, and some may have heard me say that these bacteria often aren’t in our soil. So we can purchase inoculant and treat our peas or beans. Then we can put in a few test patches with dolomite, lime, a mix of either with sea weed products or whatever we fancy, plant a few inoculated peas or beans in each and when flowering dig up a few plants. When I have done this in the past there has been a noticeable difference in the nodules of nitrogen fixing bacteria in each patch, the better the nodulation the closer to optimum mineralization. This is consulting with the little critters that put the nutrition into the vegies rather than just tipping on what someone thought was a good idea. Anyway the Chinese had a saying that it is better too little than too much because you know you are going in the right direction so if you are still influenced by the TV gardening programs promoting all sorts of expensive commercial fertilizer blends, too little may be better than too much. And to finish up, did you know the word humility has the same origins as humus, meaning of the earth, have the humility to understand that we may not know and learning will follow.